One statement people make a lot on the internet is “where’s a study of vaccinated vs. unvaccinated populations?” Well, here’s one: The effect of vaccination on children’s physical and cognitive development in the Philippines. vaccinations. 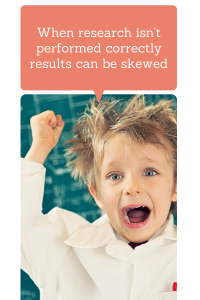 The size of the effect is large, raising test scores, on average, by about half an SD. That’s right. Test scores are increased in the vaccinated population. Higher. They did better. While our results are statistically significant, the sample size is relatively small due to the restriction of the sample to the common support. In addition, the matching of treatment and control groups may be imperfect if there are unobserved confounding factors that affect both vaccination and cognitive development. We therefore do not see our results as definitive. However, the results do however highlight the potential significance of vaccination as a human capital investment and suggest that further research in this area is warranted. So, let’s consider this question: if there is a real correlation, is it the vaccination itself (unlikely in my opinion) or preventing the diseases (much more likely)? Since as I’ve indicated, I tend towards the latter explanation, let’s consider this: another effect of herd immunity might be cognitive. Since my family and the vast majority of families in the U.S. vaccinate, many diseases are not seen here. Even the unvaccinated are protected. 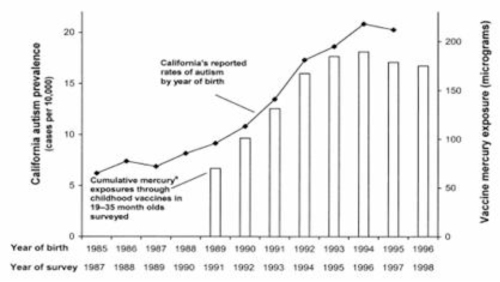 So, when Jenny McCarthy or others say, “I’d take measles any day over autism”, aside from making the huge mistake of assuming that autism and vaccination are linked, she may be saying “I’d take a half-standard-deviation drop in cognition over vaccination”. I await the inevitable, “we asked for a comparison of vaccinated vs. unvaccinated populations, but not that comparison”. Informal surveys are fraught with problems. There can be all sorts of biases. Many ways for the data to be skewed one way or another. A great example of this was the Generation Rescue phone survey. The results were all over the map, and clearly flawed. Many of the results pointed to higher autism rates in partially vaccinated over fully vaccinated children. That was four years ago. Recently an internet survey was undertaken to explore vaccine questions. The survey results can be found on the site vaccineinjury.info. People with agendas certainly can do surveys, but they shouldn’t be surprised when their agendas are pointed out. I won’t go into the survey or results in detail. I have a suspicion the results will be analyzed elsewhere. Rather, let’s just look at the autism results. Here is the age distribution of the (mostly) children reported on in the study. Very skewed towards the very young. If you are wondering, “did they just publish a graph showing high autism ‘prevalences’ in unvaccinated kids?”, you are correct. They are showing that in some age groups the fraction of unvaccinated autistic kids is about 2%. The current prevalence estimate for the U.S. and the U.K. is about 1%. Do we really want to put any weight on this result? No, not really. It is a nicely packaged internet survey, but it is an internet survey after all. Can we speculate a little as to what this means? Sure. It could mean that the groups that were recruited for this survey included more families with autistic children. Given the high recurrence risk of autism (i.e. the high chances that a younger sibling of an autistic kid would be autistic) it is not only reasonable, but predicted, that such a survey might show a high fraction of autistic kids. Keep something in mind–the number of autistic kids is small. If I did the math correctly, there are only 37 autistic kids total. [edit to add–this is incorrect. There are 44. I left out two age groups in my total] That means big uncertainties (error bars) in the “results”. Results which, as we’ve already discussed, are pretty skewed just by the design and limitations of the survey. Must be unexpected for the people doing the survey. Rather than show a low autism prevalence, they show a high one. For those who claim (sometimes over and over) that there are no unvaccinated autistic kids, here is another piece of evidence that they are wrong. Help! What am I doing wrong trying to read these graphs? The one titled autism in UNVACCINATED children shows autism percentages above the commonly accepted level in vaccinated children, but in the full study, which also shows a similar graphic, they say only 4 children in the study had severe autism. Are the graphs supposed to be the levels in vaccinated children? What am I missing here? 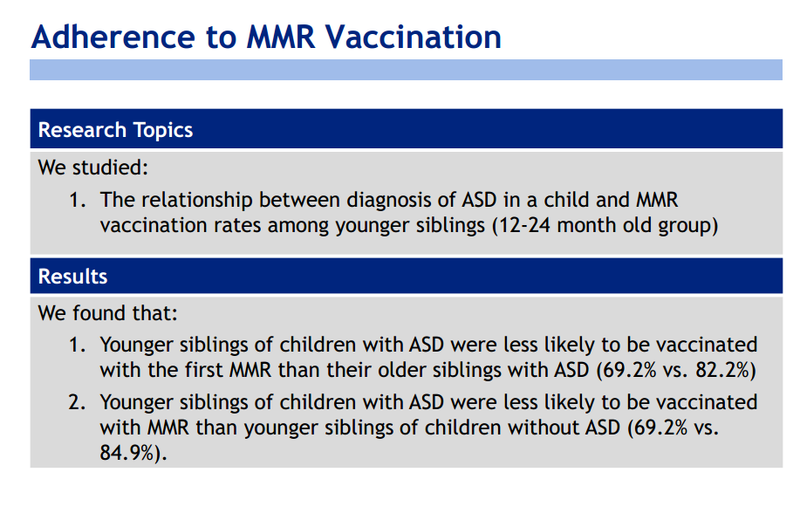 Does this study show higher rates of autism among the unvaccinated? Yes, Sarah, you are seeing correctly. The study shows higher rates of autism amongst the unvaccinated. That’s what the >1% values for ages 3-12 means when compared to the 1% value currently reported for the United States. Sarah, I see 0.57% for autism roughly half of the rate seen in vaccinated children. Note also that many who are not vaccinating are doing it because they have a child with autism already and these families have an increased likelihood of another child having autism as well. These numbers could be much lower in a larger survey and the cases are less severe as noted already. I hope this helps. Yes, if you want to water down the results by averaging, including infants too young to be reliably diagnosed, you can get a lower prevalence. 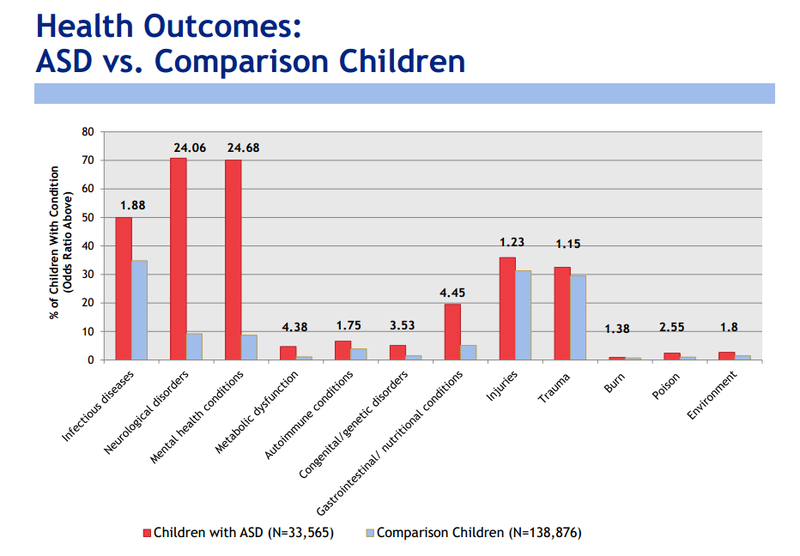 Of course, to do that one has to ask: what is the prevalence of diagnosed autism amongst infants? We don’t know. Due to the fact that the majority of children in the survey are between 0 and 2 years of age and some diseases generally do not appear in this age group, the results are subdivided into different age groups (click on the graphic). Information about country, gender, age, age distribution, breastfeeding, preferred tretment[sic] can be found here. And they are correct. There are no autistic kids in the age 0-2 group reported. Looking at just the ages 3-18 kids, there are 4326 kids, making a “prevalence” of 0.85, if you want to average. That would be within the error bars of the current autism prevalence estimate in the U.S..
As I’ve noted, the Age of Autism blog has already discussed this (thanks to those who sent me the link). I doubt this will get much play from these groups as the results are really not good from their point of view. Conclusion: you are 1% more likely to have PDDNOS if you are unvaccinated. If you are fully vaccinated your chance of being PDDNOS is 1% less than if you were unvaccinated. Conclusion: you are 2% more likely to have an ASD if you have been partially vaccinated. If you are fully vaccinated your chance of being autistic is 1% less than if you were unvaccinated. Overall conclusion: the best way to avoid being diagnosed with an ASD is to be fully vaccinated according to the CDC schedule. – Consideration should be given to broad biomedical research including laboratory studies, and animal studies. – Outcomes to assess include biomarkers of immunity and metabolic dysfunction, and outcomes including but not limited to neurodevelopmental outcomes, allergies, asthma, immune-mediated diseases, and other developmental disabilities such as epilepsy, intellectual disability and learning disabilities. – The inclusion of autism as an outcome is desired. This review should also consider what impact the inclusion of Autism Spectrum Disorders (ASD) as an outcome would have on study designs and feasibility, as referenced in the IACC letter to NVAC. – This review should be conducted expeditiously, in a transparent manner, and involving broad public and stakeholder input. So, as per a straight ‘vaccinated vs unvaccinated’ study, Ian Lipkin and NVAC Working Group agree that it can’t be done in the most scientifically accurate way and even if it could, it wouldn’t be ethical due to the requirement of excluding children from vaccination. What they are saying is that a group like the IOM therefore should write up a feasibility study as to how such a study _could_ be done. Without this, its extremely unlikely that a vax vs unvax study will ever fly. Amusingly, the way that the NVAC Working Group words a possible solution – vaccinated vs unvaccinated via parental choice – sounds pretty much like the Generation Rescue phone survey. And we know how that ended up. Do vaccinations put too much strain on or weaken children’s immune systems? Roma Schmitz and her colleagues from the Robert Koch Institute investigate exactly this research question in the current issue of Deutsches Ärzteblatt International. Their data are based on the results of the German Health Interview and Examination Survey for Children and Adolescents (KiGGS).